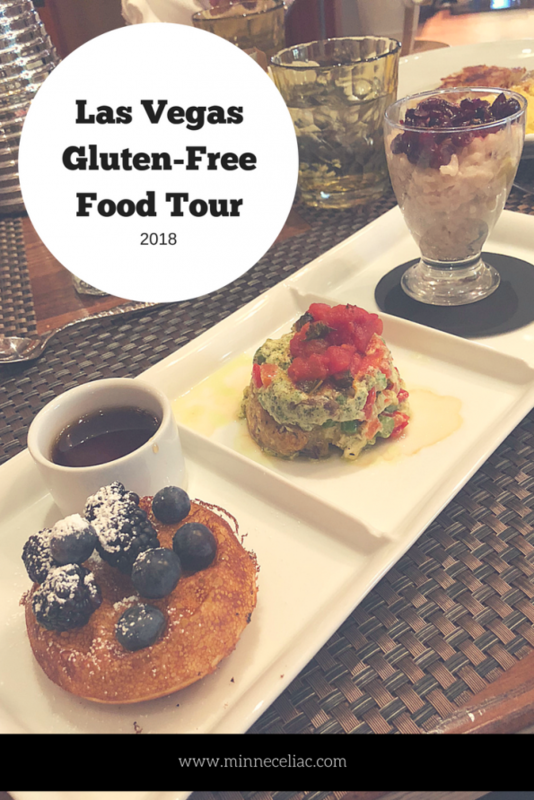 I’m finally getting around to sharing ALL about our gluten-free/celiac-friendly food finds during our Las Vegas weekend getaway last month! 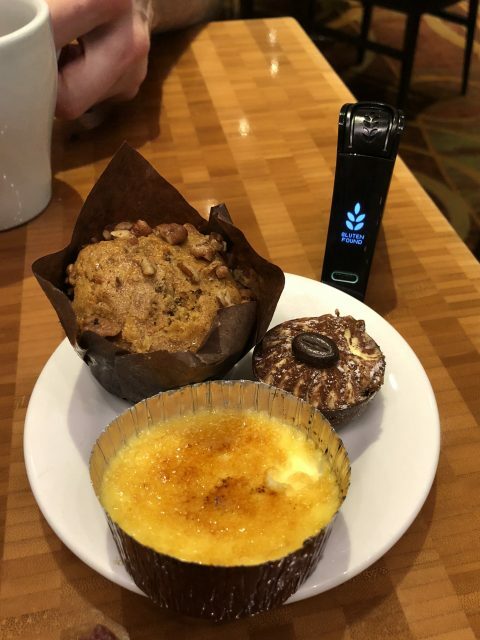 We found some really great places to eat and even some that didn’t pass the Nima test, but everything ended up working out in the end…like it always does. 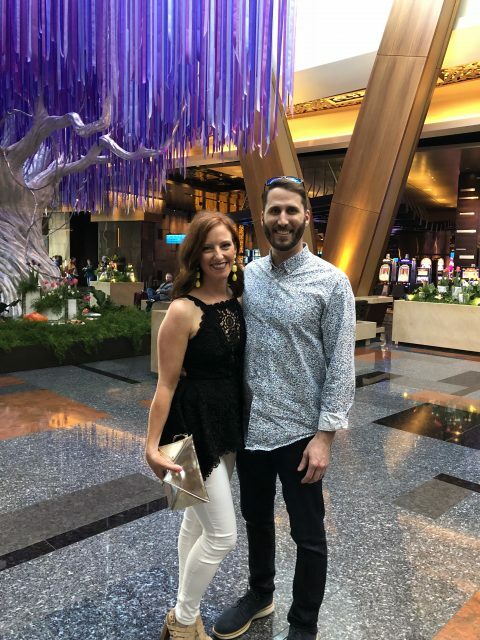 So where did we eat in Vegas and were they truly celiac-safe? 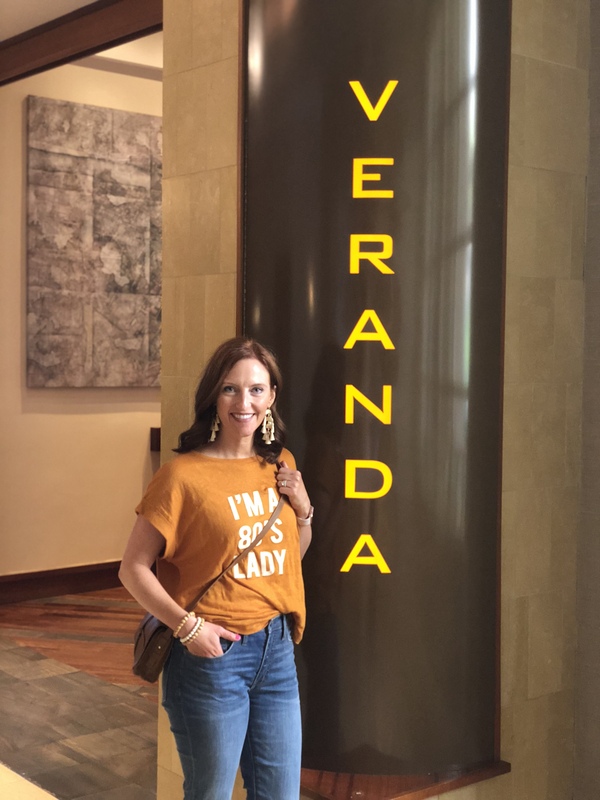 On our first morning, we took an Uber to the Four Seasons (ooh fancy) and ate at Veranda. It was perfect. Their regular menu was filled with gluten-free options and I had read great reviews of this restaurant. 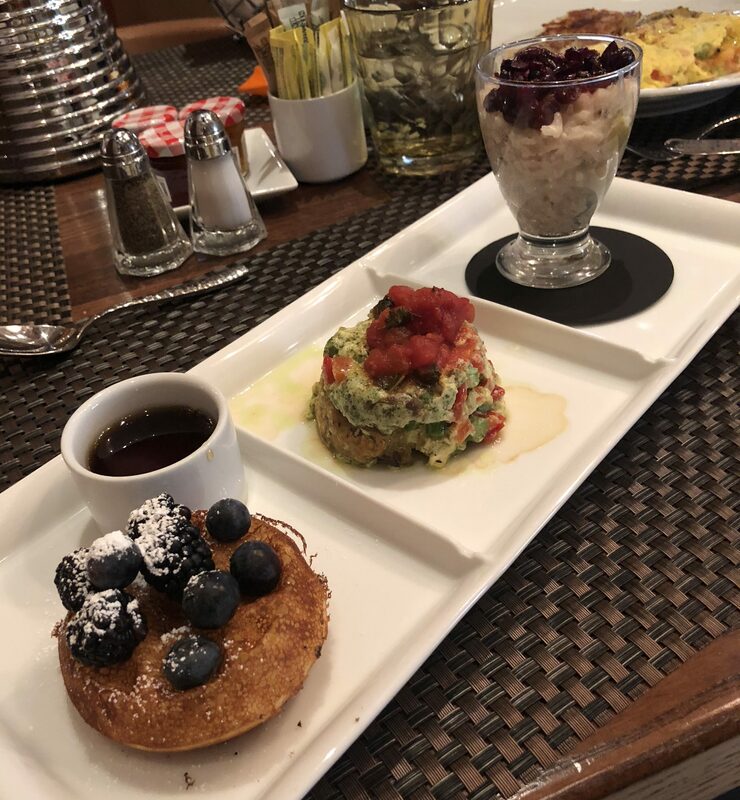 I chose the gluten-free sampler which came with a waffle with fresh berries, egg white scramble, and almond milk chia seed pudding. I Nima tested the waffle and egg white scramble and both came back as safe. 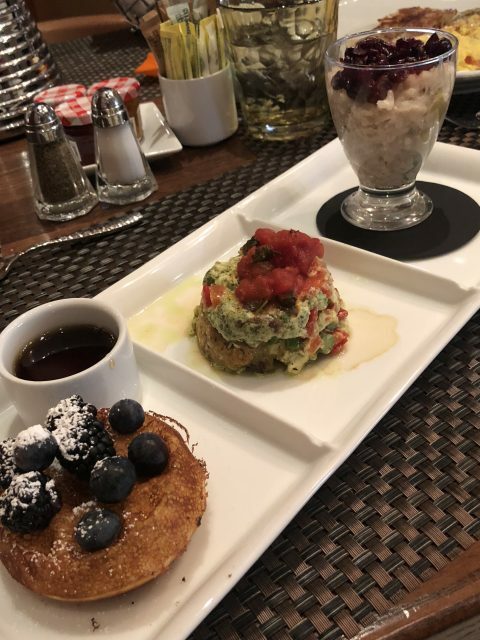 I skipped testing the chia seed pudding because I figured that would be the safest option on my plate and I didn’t want to wait for it to test. Also, they had delicious coffee!! We ate such a big (and late) breakfast that we went back to our room and slept most of the afternoon! I think we were taking advantage of our quiet time away from our kids! That night we decided to go down to the other end of the strip and eat at El Segundo Sol. 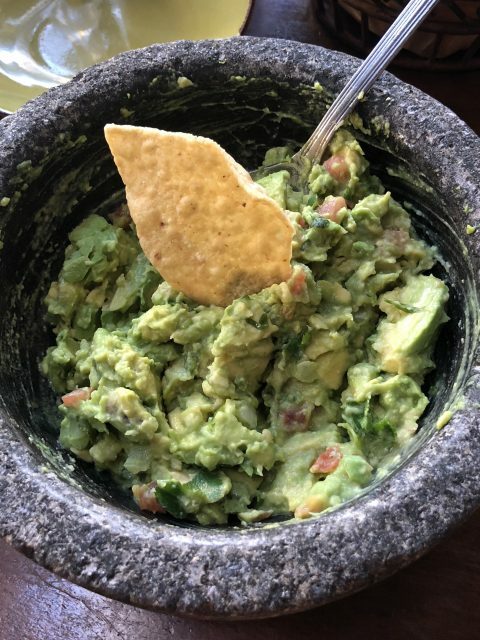 This is a Mexican restuarant that is owned by Lettuce Entertain You Enterprises – the same group that owns Twin City Grill at Mall of America (one of my all-time favorite safe spots in the Cities!). 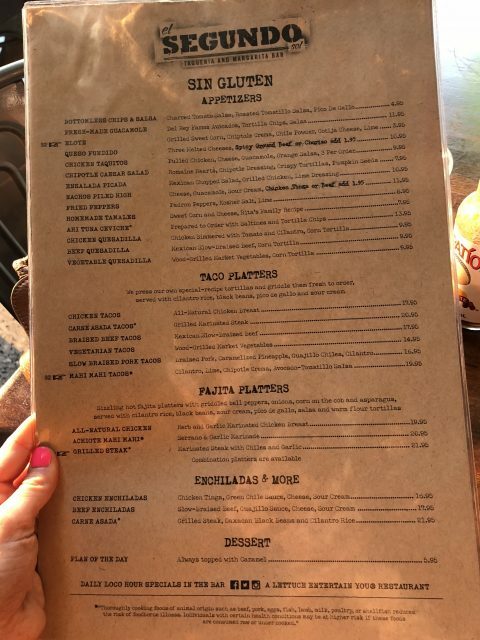 They have an entirely separate gluten-free menu with a ton of options (ask for the menu at the hostess stand)! The next morning we slept in and didn’t eat breakfast (well, we snacked on some of the things we had in the room like beef sticks, Glutino cereal bars, popcorn, nuts, etc.). We were excited to eat at the buffet because we heard they had great gluten-free options. My final decision is that THE ARIA BUFFET IS NOT CELIAC-SAFE! But read on to see what I got and what Nima found! We waited in quite a long line, but it was right at lunch time and it was the weekend so that’s why. Then we had to wait again for a chef to take us through the line. The chef was very nice and knowledgable when he took us through the line. He pointed out what was and wasn’t safe, but he was going through it so fast and there were so many options that I had a had a hard time remembering what was safe. You know it’s probably not going to go well when they start off by saying that even the ranch dressing at the salad bar is not even gluten free. I was also told that I could ask for a personal pizza to be made so I put in a order with the one of the line chefs for a margherita pizza. They have premade gluten-free crusts, but I was warned that they are made in the same oven as the regular pizzas. The chef also explained that the line chefs are not trained on allergies. 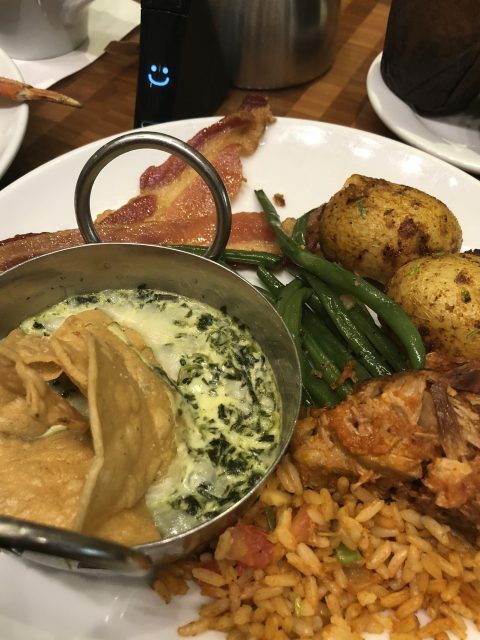 My first plate of food included spinach dip and tortilla chips, pork carnitas and seasoned rice, bacon, seasoned potatoes and green beans. Totally random assortment, I know, but I was so worried about cross-contamination on a buffet that these seemed like the best options. 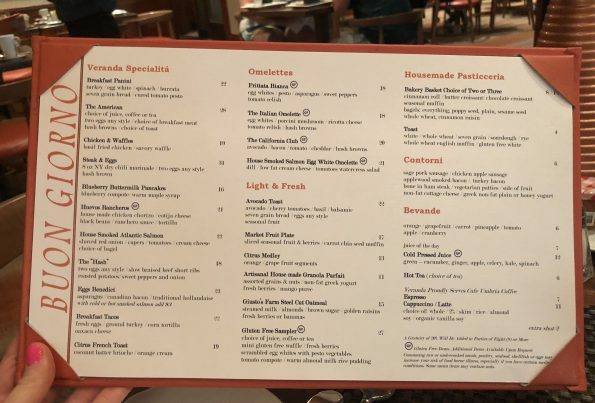 I also grabbed a couple of desserts – a banana muffin, creme brule, and a tiramisu – all of which I was specifically told by the head chef were gluten-free. I first Nima tested my big hodgepodge plate of food and everything came back safe to eat! 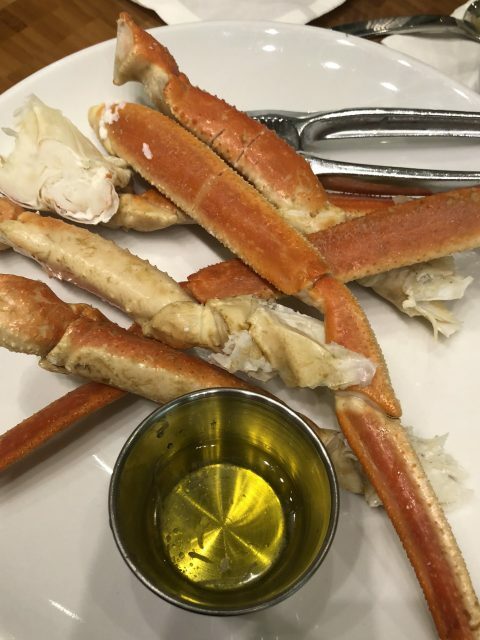 And then I got a big plate of crab legs and didn’t test those because I figured they would naturally be safe! Brian went up to get my pizza after waiting about 10 minutes and I tested that. I was REALLY looking forward to eating pizza as I usually only eat frozen pizza at home. So bummed that my Nima came back with gluten found. 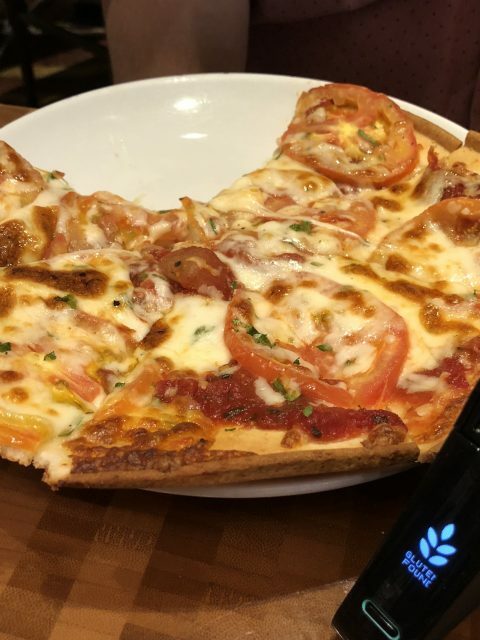 🙁 Brian and I talked about it and decided that it was probably because even though they had gluten free crusts, they most likely didn’t use separate sauce or cheese or pizza cutter and there was major cross-contamination. I also Nima tested my plate of desserts. 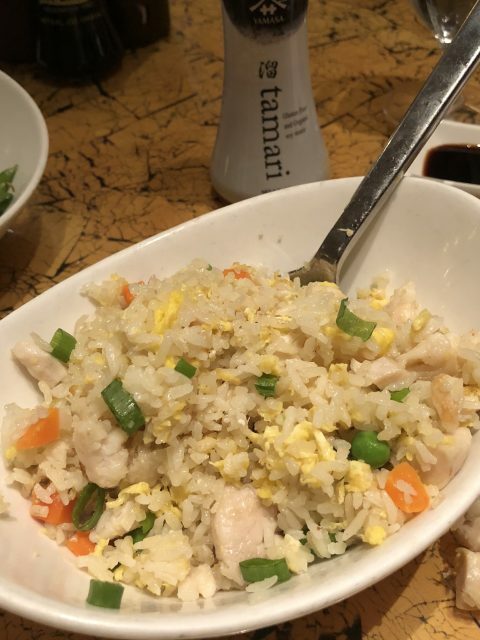 For this, I tested a little bit of everything which is what I normally do because test capsules are $5 per piece and I already used two for this meal. Something (or maybe it was everything) came back with gluten found. 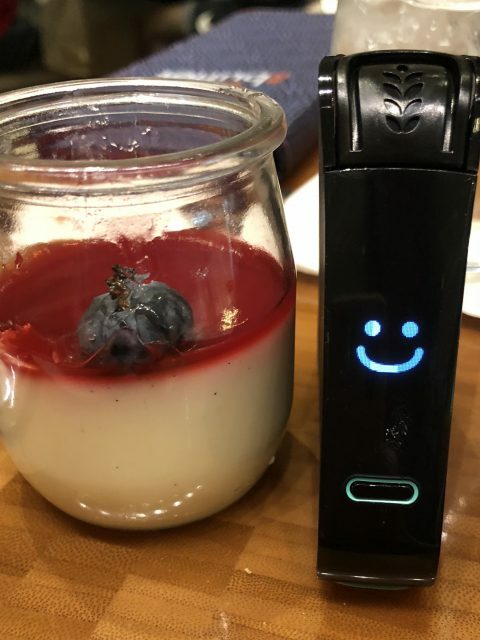 I gave one last thing a shot – the panna cotta – and it came back safe. So on top of not being able to eat most of the food on the buffet, I also spent an extra $15 on just testing my food. You know what though? I didn’t get sick so that is definitely worth the money to me! 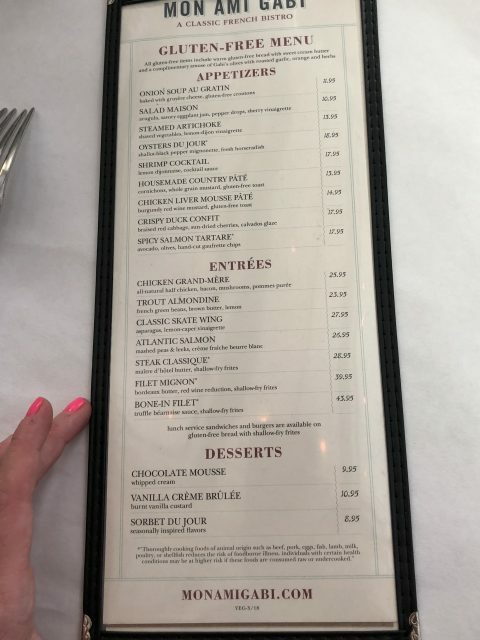 Before we headed out to the Justin Timberlake concert on Saturday night (he’s my all-time fave, btw), we had dinner reservations at Mon Ami Gabi which is located at Paris Hotel. 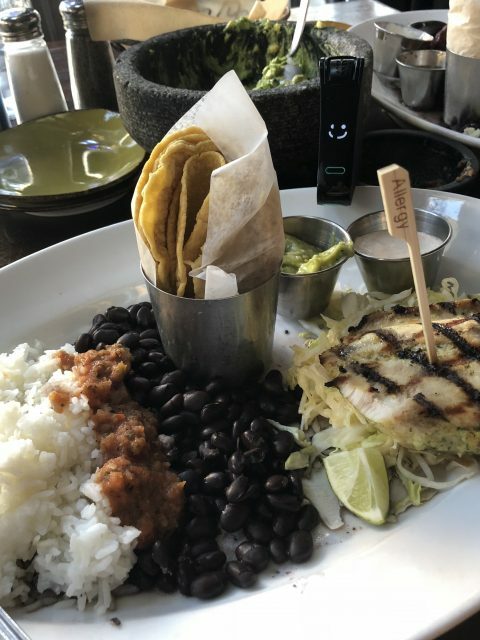 This is another restaurant owned by Lettuce Entertain You Enterprises and they had raving reviews on the Find Me Gluten Free app, so I was not worried at all. I was so excited for this meal! The waiter brought us some gluten-free bread with honey butter, olives, and a carrot salad for starters, which is offered to every table. 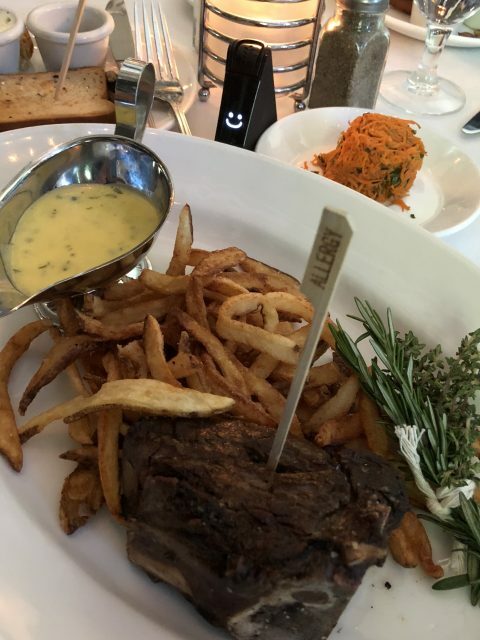 I ordered the bone in filet with frites and bernaise sauce. I love bernaise sauce! Everything was DELICIOUS and PERFECT!! Can you tell I loved everything. Plus, I Nima tested my plate of food and everything came back good. 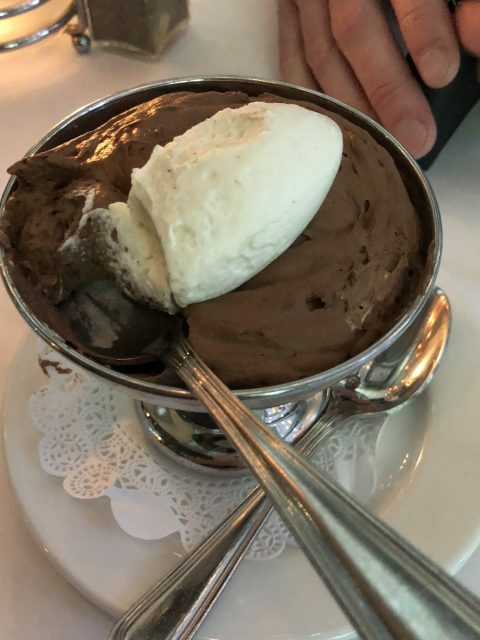 For dessert, I did order a chocolate pudding type dessert. My Nima sensor had an error on it (which means $5 down the drain), but it was probably due to the texture of the food. I also decided to just go ahead and enjoy my dessert! We had a couple of Starbucks in our hotel so we could order from the iPads that were in our room and go and pick up our breakfast downstairs. We did this the last two mornings simply because it was quick and easy. 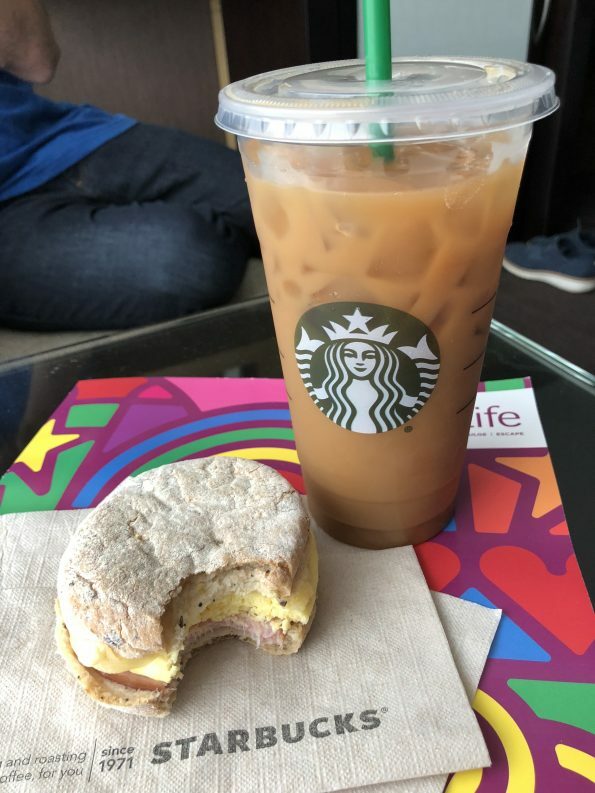 I hate to even write about this because now Starbucks has discontinued their gluten-free breakfast sandwich which is extremely disappointing. And now the Celiac community is extremely limited on any quick breakfast items that can be purchased when out and about. Here we are, back at another Lettuce Entertain You Enterprises restaurant. But, I was wanting a good burger and a beer and was hoping this was the place to find it. It sure was!! If you’re looking for one of the only places to get a gluten-free beer, then you’ll find it at Stripburger. The one they sell is by Joseph James and it’s called Foxtail. 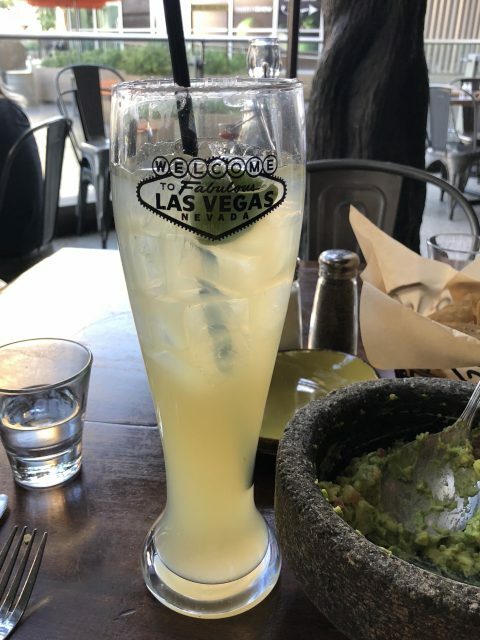 We asked at a TON of places if anyone had gluten-free beer and we only found it here, at El Segundo Sol (because they are basically connected and owned by the same people), and at Yardbird at The Venetian. We were able to pull the manager aside and just thank them for having gluten-free (and safe) options. If I find a good place to eat, I always try to share my gratitude with the management because I sincerely appreciate having good food options outside of the home. I think that it makes them feel appreciated and want to continue to help us! Another thing that I was SO looking forward to was having sushi. I haven’t really had sushi anywhere in Minneapolis since my diagnosis. We used to eat sushi ALL. THE. TIME. Sometimes sushi places use a wheat based instead of rice wine vinegar for their sticky rice. This, can obviously contain gluten. Sushi usually includes so many different sauces and toppings that can also be contaminated. Rice & Company, like so many of the other restaurants we visited, had a separate gluten-free menu with a good variety of options. The staff was also very knowledgable. 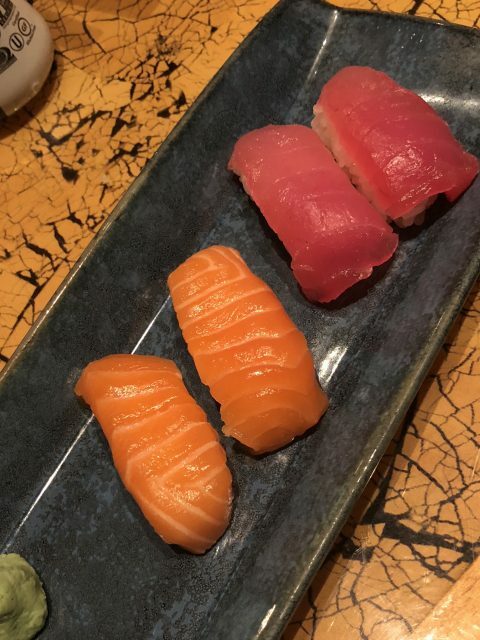 So we ordered edamame, a spicy tuna roll (one of my all-time favorites), a rainbow roll, and a salmon roll. Pretty basic. 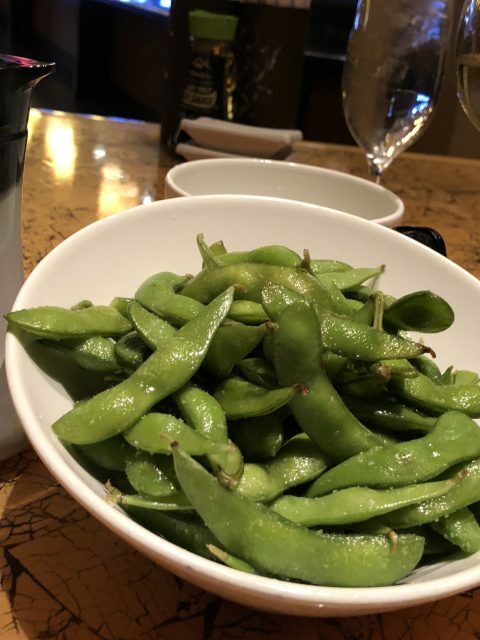 I did test the edamame with my Nima and that came back just fine. We knew that it would, but just wanted to be sure! 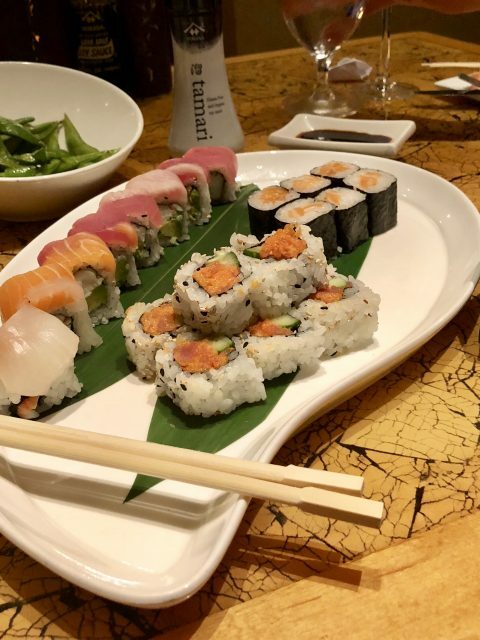 We then tested a little bit of everything on our sushi platter. Nima detected gluten somewhere on that beautiful plate of food and we couldn’t quite figure out where it could have come from. The manager came over as well as Chef Simon who was absolutely amazing. He talked us through basically all of the ingredients, double checked the rice vinegar used for the sushi, and he even made us new food himself. He made us chicken fried rice and some new sashimi. I saw him bring a new cutting board out to the sushi station and clean all the surfaces before cutting our fish. My final thoughts were that there was probably cross-contamination somewhere on the sushi bar. 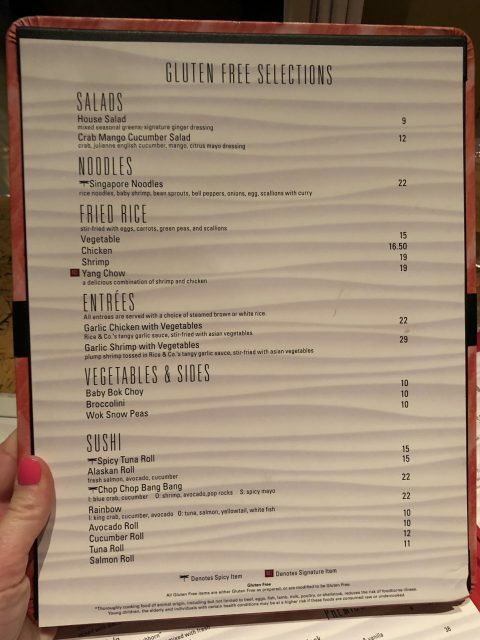 The chef even said that he is looking into putting more options onto the gluten-free menu and even though we did have some difficulty here with my Nima Sensor, I would go back! The staff was also incredibly interested in the Nima and how it worked and I was so happy to share my knowledge with them! Even though we had some misses on our trips, I would say that our hits were pretty great!! I hope that this helps you realize that you can travel with Celiac Disease! You just need to advocate for yourself and be prepared with nutritious snacks, know the right questions to ask about cross-contamination, and be grateful when you find those that are willing to do everything they can to keep you safe!! BONUS: My list going into this trip! 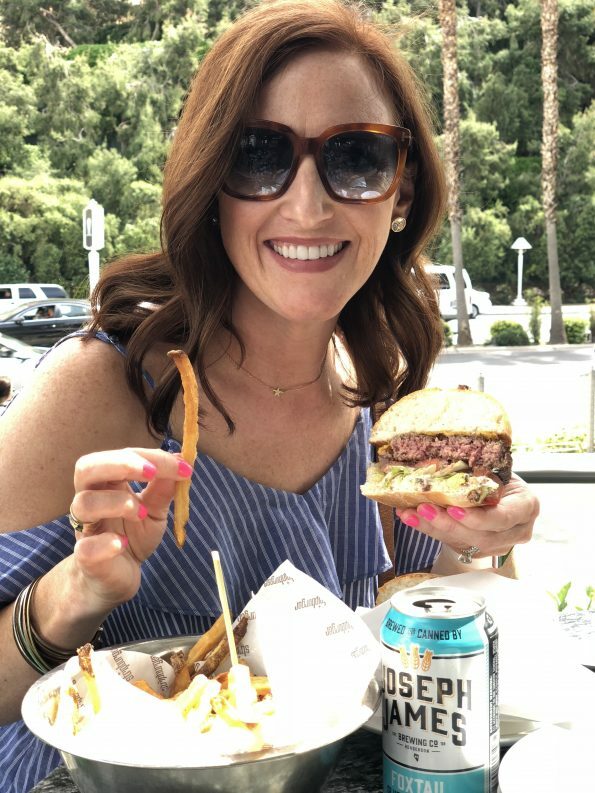 I did a lot of research prior to our trip to Vegas and had a long list of places that I heard were gluten-friendly by reading blogs, searching Find Me Gluten Free, and scouring Instagram. I am sharing my list I put together in case you’d like to do some research for a future trip of your own!